Green beans are the unripe, young fruit and protective prods of various cultivars of a common plant known as Phasseolus vulgaris. It was first cultivated in Central America and South America. 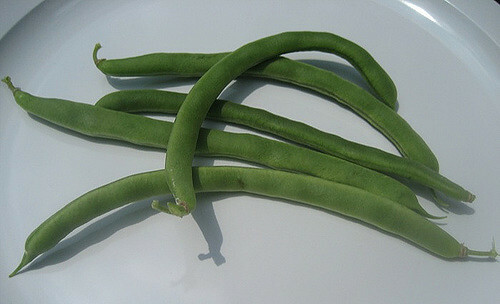 Green beans are rich in starch and proteins, and they play a key role in the nitrogen biological fixation process. However, there is also something else about it. Thus, it appears that during the last century students in boarding schools were forced to eat green beans when there was nothing else to eat. Back then, green beans were perceived as a low quality nutriment; such as, it is green so it must be good for health, but not the kind of stuff people were dreaming about. That said, there was also a powerful symbol attach to it; something that could be seen as the equivalent of a canary in a coalmine before the fatal firedamp explosion. Hence, we knew back then that once the last green bean eaten and the reserve emptied, that the ending was close. La fin des haricots was in fact The end of everything. Holding onto their own string of life, those unfortunates dreaming of better days on an empty stomach were breathing panting while waiting in complete disbelief of a nearby ending. By chance, some of us were more pragmatic than others were, and always kept a secret reserve somewhere in a well-guarded vault. In case of. Which is much easier to manage than having to deal with the end of the world. We can all agree on this. Things have evolved since then. Most boarding houses have closed and the green beans appear to have won their spurs over the years. In fact, we can now find them anywhere, at any point in time during the year. There is no need to keep a secret reserve somewhere. We simply need to go to any supermarket and look for it. No shortage in sight. Better for us and better for our nutrition. Quite a successful change of ordeal. However, unfortunately, again, there is more to it. Today, we witness occult and regressive forces that enable people in bringing us back in time. Those people try to make us believe that La fin des haricots is right ahead of us. Of course, not everyone believe in such a silly thing. Nevertheless, they speak forcefully and try to impose on others their simple-minded, single-minded, idea of a so-called beloved dream homeland that otherwise appears to be a vacuous mono-cultural space, forcefully exclusive, not inclusive. This is scary. Even though they are speaking forcefully, they are nothing else but a bunch of pathetic snowflakes, intellectually incapable of any form of pragmatism and rationality. We find too many of these individuals in the US; and, to a lesser extent, in Canada too. They constitute a solid base of fanatics, which see Donald Trump as their savior, in helping help them escape their mediocrity; not the con man Trump has always been. In their view, this unhinged saviour will help them preserve their pretended white male supremacy over the rest of humanity. In my view, they are on the wrong side of history. We have seen with the green beans. They will not succeed. There is a secret reserve somewhere. We will soon see what will happen during the November 6 mid-term elections in the US. La fin des haricots is probably not on the agenda, yet.